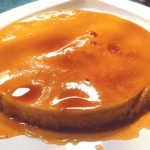 Leche Flan or Crème Caramel is a soft, smooth and velvety custard dessert. This is a common dessert all over the world but with different variations. In a pan, melt the sugar over medium heat until it liquefies and turns an amber color. Stir the Sugar occasionally to make it Smoother and Crystal-Free Syrup. Once the syrup acquires the color of amber, quickly remove it from the heat and pour into the Llanera to cover the bottom. Caramelized sugar hardens as it cools and you need to work fast to transfer the syrup to the ramekins before it hardens in the pan. Start heating water in a steaming pot. In a bowl, stir the eggs yolks. Pour in the evaporated milk and sweetened condensed milk. Add the salt and lemon zest. Stir until the mixture is evenly blended. Stir, do not beat nor mix too hard, to avoid forming air bubbles in the mixture. Pour the egg yolk-milk mixture into the ramekin. Steam over simmering water for 20 to 40 minutes depending on the size of the cooking vessel. The leche flan should be set and firm to the touch. Remove the Llanera from the heat. Cool the leche flan then chill. This video shows another recipe for Leche Flan.